5 reasons we love technology! Here are top 5 reasons why we love technology and can’t do without it. What would you have done 10 years back if you wanted to find out the best restaurant in a certain location after you’ve already stepped out? Maybe call a friend living nearby or just ask around local people? The internet has significantly reduced everyone’s dependence on each other to find answers to everyday questions. Whether the information is authentic or not is a different question altogether, but the fact still remains that we look up Google for knowing a range of things from how to know if you are pregnant or not, what it the price of petrol for the day, is Infosys is a good bet to invest in, how to remove spice stains from a white shirt or finding a perfect match online. It’s amazing how the need of doctors and preliminary medical help from daily life has been heavily reduced. From athletes who want to track the increase in their running speed to diabetic patients who want to know what foods cause an instant rise in their insulin, all they’ve got to do is attach small gadgets to their bodies. Even things like monitoring traffic over a website, watching profiles of customers who’ve bought your products or knowing how you’re business sales have been faring in comparison to the industry standards, technology has made everything a piece of cake. With mobile technology having boomed in the past decade, especially in India, live updates are a thing of the past. In fact, there have been cases internationally when someone’s life has been saved because of a Twitter feed of an impending earthquake, tracing imposters becomes easy by digging out their internet browsing history and social media footprints or helping someone in a crisis through GPS spotting. We love technology because it can keep us and our families safe if used at the right time, isn’t it? Yes, yes we know that there’s absolutely nothing new in this but that is exactly the irony we want to point out as the primary reason for all of us to love technology. Social media has been so overused by the world that it feels like it’s been around from ages. From couples in long distance relationships, to students studying away from home, from re-connecting with friends who haven’t been in touch from more than 10 years to getting second opinions on medical reports from overseas, social networking and online messaging services have made the world a smaller and a more efficient place. One of the prime reasons why most people love technology is because it treats everyone as an equal. Availability and benefits of technology are not dependent on gender biases, religion, caste or creed. Technology, especially the internet, is an oasis where you can opine freely and anonymously, eradicate the barriers of language, time zones and cultures. Not only that, it’s great for education and business and serves as a window to the world. Today, a person in India can know about all the corners of the world without having taken a single step out of his/her country, only because of technology! Imagine what a throbbing power India will become when everyone will be able to fully utilize the power of technology – whether it is through the internet, new gadgets, medical advances or simply machinery that can make this world a better place to live in. So there you have it – Our Top 5 reasons why we love Technology – Off course there are hundreds more reason, but these are our most important reasons! 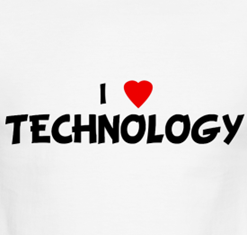 "5 reasons we love technology! ", 5 out of 5 based on 1 ratings. 5 reasons we hate technology! it’s easy , fast and comfortable exmple you can talk to many people easlly and don’t need to go or meet them tust make phone or send amssage . to make you sure about your sulitiions with any problem and give you more true informations with short time . if you want to have power and save your life. Enhancement in technology is always helpful for human technology not only reduce time but also optimize result & make result more accurate. Technology has given us so many things that were beyond the realm of possibilities earlier. So we have several reasons to love it.